NetworkThermostat, a leading communications-based thermostat manufacturer since 1995, announces the availability of a new BACnet Gateway, the NT-BAC/IP for XBus™ wired and StrongMesh™ wireless systems. The NT-BAC/IP connects directly to your existing NT-IPXB Network Controller, NT-SSA32/CLK Network Controller or NT-SSA16/CLK Network Controller and converts the information to BACnet/IP. The system comes ready to support 32 thermostats out of the box. This allows the user to control and monitor the XBUS network from any building automation system capable of communicating over BACnet/IP. The NT-BAC/IP includes standard RS-232 port, RJ45 jack for 10/100 Mbps Ethernet, and 9V DC power supply. Mounting tabs allow for simple wall mount installation. Net/X continues to lead the market with flexibility and simple installation solutions for commercial HVAC control and energy management. For years, Net/X has listened to its customers and incorporated many user requests into its products. Now, we’ve taken those request and created the NT-BAC/IP gateway to integrate Net/X HVAC controls with any BACnet™ building automation systems (BAS). The industry standard Building Automation Control Network (BACnet) protocol is used in nearly all major building automation systems (BAS). 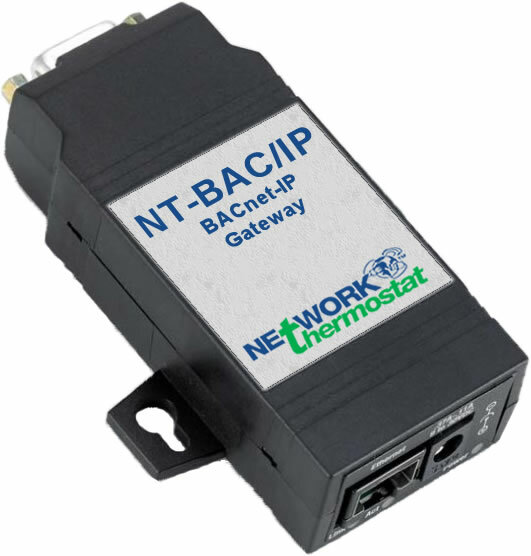 The NT-BAC/IP connects directly to any one of four powerful Net/X platforms and translates the information to BACnet/IP, adding BAS support for all Net/X thermostats, remote sensors and programmable relays. Commercial facilities can start managing their HVAC systems and saving energy dollars with system programmable wired XBus™ or wireless StrongMesh™ platforms to schedule and manage your HVAC system. As the facility continues to expand and the need for lighting control, access control and event management becomes a requirement, the investment in the Net/X HVAC system is safe. Simply add a NT-BAC/IP to the existing Net/X system for simple integration with the BAS system of choice. NetworkThermostat integrates seamlessly with your expansion decisions. The NT-BAC/IP includes powerful auto discovery and point mapping of each Net/X device. When integrating with the Net/X system-programmable XBus™ (Wired) or StrongMesh™ (Wireless) solutions, it’s as simple as plugging the NT-BAC/IP into the LAN, entering the IP address of the Net/X system scheduler (the NT-IPXB), and connecting the BAS via Ethernet. The NT-BAC/IP does the rest. Also, the NT-IPXB system scheduler includes a Net/X exclusive BAS system failsafe override. This feature will allow the BAS system to control the HVAC units unless the NT-IPXB does not receive a “BACnet active” response, whereby the NT-IPXB resumes as the primary HVAC scheduler and runs the HVAC systems accordingly. Capable of supporting up to 32 thermostats, the Auto-Discovering BACnet Network, NT-BAC/IP, includes standard objects (a.k.a. points or data points) such as Analog Inputs, Binary Inputs, Analog Outputs, Binary Outputs, Analog Variables, and Binary Variables. The flexible NetworkThermostat energy management platform allows for thermostat BACnet control from a local area network (LAN) or from anywhere with internet access. As with all Net/X products, there’s no need for a cloud service and there are no associated fees. The NT-BAC/IP has been developed in conjunction with Earthsmart Controls using NetworkThermostat’s proprietary API. The proprietary API allows software developers and hardware integrators the ability to quickly and seamlessly integrate the Net/X system into other control and automation platforms. Earthsmart Controls specializes in building automation and facility management systems. With Earthsmart Controls automation systems, end users receive complete control over HVAC, lighting, access, security and water systems to allow facility owners to save tremendous amounts of money and energy.